Welcome to Homeschool Goodies! Although this site does contain links to secular sites, it is my goal to provide homeschool information that is faithful to our Holy Father Pope Francis and his successors, to all bishops in union with him, and to the Magisterium of the Catholic Church. When do the swallows come back to Capistrano? For her second pointe solo, Audrey has chosen the Dulcinea dream variation from Act 2 of Don Quixote. 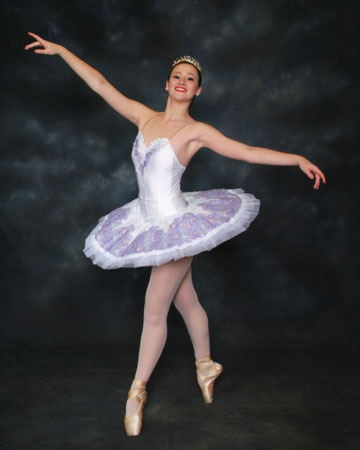 I will be attaching a lilac, bodice-style leotard to the white 9-layer Sansha tutu that we purchased last year. 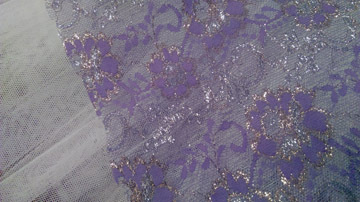 We’ll embellish both tutu and bodice for a lilac/white finished costume. I have been collecting some lace trim & fabric. Not sure yet if all will be used. 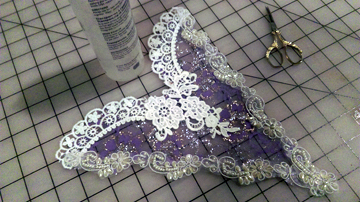 The lilac lace was only $3 and will be used to make a plate to cover the tutu. 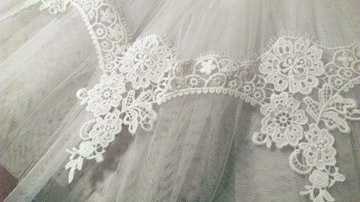 The white lace trim is very pretty and big. Found on ebay for $7. Not yet sure where that will fit in. 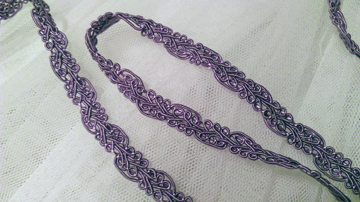 The lilac cording will certainly come in handy, and a steal at $1.96. Change of plan. There is always a change of plan! We will not be attaching a leotard to the tutu. We have decided to use our Mondor bodice leotard instead. Gives us a completely white base for adding our lilac embellishments. Stay tuned! Creating a tutu plate sounds much easier than it is. This one is coming along nicely. 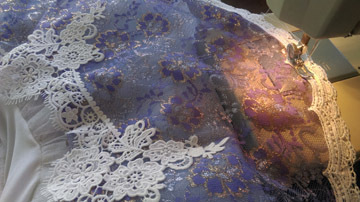 The big lace is near the hips and will blend the white bodice into the plate. I had to figure the diameter of the tutu and the actual size of the opening at the hips. Since the tutu has a stretchy basque this was a bit tricky. The center opening is slightly oval rather than being perfectly round. I left a fair amount of the lace fabric over on the edges so we could trim it to the size of our tutu once the hip area was determined. Today I created the bodice decoration. The top is the same lace as on the tutu plate and the trim forming the “V” was taken from a “Copelia” costume from several years ago. It pairs nicely with the plate. Since the bodice is stretchy, sewing the decoration on is a bit tricky. I have the dancer put on the bodice and then I mark a few strategic places to attach the decoration. Lots of hand sewing. After ironing and retagging the tutu, I attached the lavender plate. We are very pleased with the costume and will see it in action this Friday at rehearsal. At that point we will know if we need to make any adjustments. We ended up not using the lavender trim so our grand total so far — $10. After seeing the costume in action at rehearsal, I decided the tutu needed to show a bit more white. I cut about 2 inches off of the edge of the plate, purchased a nice white scallop trim, and edged the lace plate. I found the trim on eBay for $13.62. 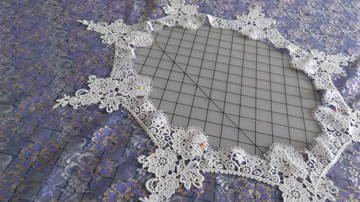 I sewed the lace to the edge of the plate. Yes, it would have been easier to sew if the plate had not been attached to the tutu, but after getting it just where I wanted there was no way I was going to remove it. Afer sewing, I tacked the pointy edges down with glue. This addition really finished off the tutu nicely and puts our grand total at $23.62.